The Right Prize Video Slot Review - Casino Answers! The Right Prize is a 5-reel, 25-line video slot developed by Vegas Technology, featuring a wild symbol, scatter wins, multipliers, a free spins feature and a bonus game. You can play the Right Prize video slot at Bovada. The Right Prize is a penny slot. Bets on the Right Prize slot machine are $0.01, $0.05, $0.10, $0.25, $0.50, $1, $5 and $10 per line. You can select up to 25 paylines on the Right Prize online slot game. You can bet anywhere up to the maximum total bet of $250 per spin. The Right Prize has a very good betting range that will suit just about any online casino player. Players can use the skill stop feature to stop the reels at any time during a spin. To play the Right Prize video slot, select your bet and hit “Spin” or simply hit the “Bet Max” button. The Logo is the top-paying symbol on the Right Prize casino game. If you hit 5 Logo symbols on an active payline, you will win the 10,000 coin top jackpot. The Logo is wild and will substitute for all symbols except for the bonus and scatter symbols. The second highest paying symbol is the Yacht symbol, which can pay out up to 1000 coins. The Doors symbol is the scatter symbol on the Right Prize slot game. If two or more scatter symbols appear anywhere on the reels, it will generate a payout. You can win up to 100X your total bet in scatter wins. If three or more Scattered Doors symbols appear anywhere on the reels, you will win 10 free spins at a 3X multiplier in addition to your scatter win. Additional free spins can be won during the free spins feature. All wins are tripled during the free spins feature, except for bonus winnings or additional free spins. All payouts are based on the paytable. Only the highest win per selected payline is awarded. All symbols pay left to right in consecutive order, except for the scatter symbol (which pays in any position). The prizes shown in the bonus game have a random money amount associated with them. Scatter wins are multiplied by the total bet. Scatter wins are paid independent of paylines selected. Hit “Autoplay” to open up the Right Prize autoplay mode where you can select the number of spins (5, 10, 25, 50, 100, 250 or 500) and number of seconds between spins (1, 1.50 and 2). Stop settings include stop once all spins are complete, stop when jackpot is won, stop if a win exceeds or equals ($50, $100, $150, $200 or $250), stop on any win and stop if credits increase/decrease by ($50, $100, $150, $200 or $250). You can cancel autoplay on the Right Prize online slot at any time. 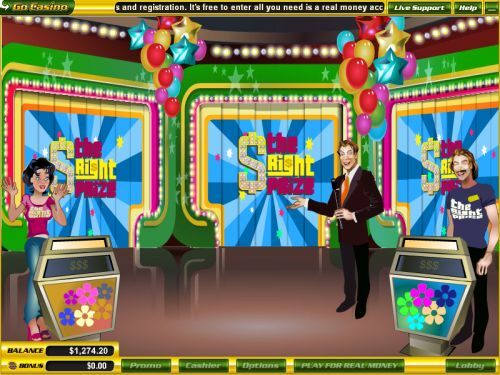 The Right Prize does a decent job of capturing the feel of the Price is Right TV game show. Its game features include a great 10,000X top payout, a free spins feature with a multiplier and a series of difficult-to-trigger bonus games. You can play the Right Prize video slot today by signing up and making a real money deposit at Bovada. Can USA players play the Right Prize video slot for real money? Yes, American players can play the Right Prize for real money at Vegas Tech online casinos such as Bovada. 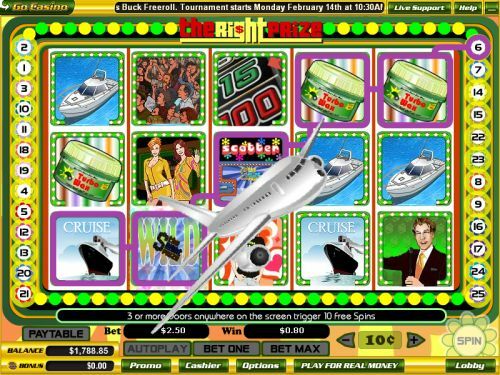 Can I play a free flash game of the Right Prize video slot? Yes, a Right Prize flash game is available to play for free or real money at Bovada. If you come across any issues with the flash casino, download the latest version of Adobe Flash Player.